The 67th Republic Day was celebrated in all its solemnity and grandeur at K.R. 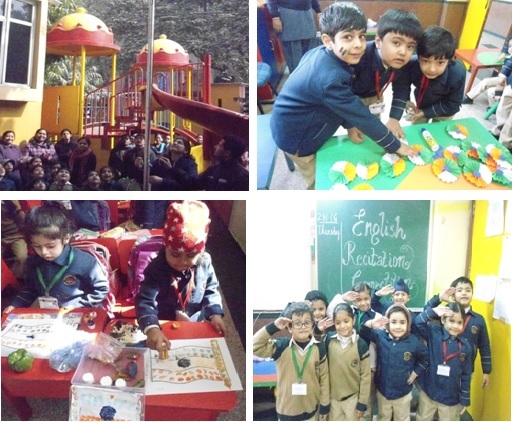 Mangalam World School, Paschim Vihar on 26th January 2016. To mark the importance of this day, a grand celebration was held in the school and many activities were planned in the school premises. The day began with the morning prayers. Afterwards, the In-charge Ms. Shalini Kaul unfurled the National Flag followed by the National Anthem . The school echoed with patriotic fervor as the students of class 1 were dressed as freedom fighters to mark the occasion and they were given a platform to speak few lines on any one freedom fighter thus felt proud to be an Indian. Students of class KG made tri-colored badges using fan folding technique and a broad smile could be seen on everyone’s face when the Nursery students did vegetable printing on the Indian flags given to them. The students took pride in glorifying and celebrating the spirit of unity.